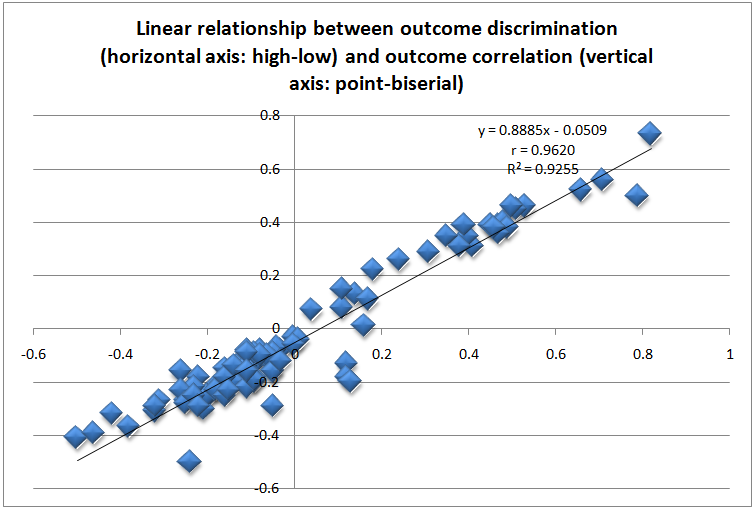 In my previous blog post I talked about outcome discrimination and outcome correlation and their relationship to one another. Now I will provide some criteria that can be used for outcome discrimination and outcome correlation coefficients to judge whether a question is making the grade in terms of psychometric quality. I’ll be back with more juicy psychometrics soon! In my previous blog post I dived into some details of item analysis, looking at example questions and how to use the Questionmark Perception Item Analysis Report in an applied context. I thought it might be useful in this post to talk about outcome discrimination and outcome correlation, as people sometimes ask me how are these different or the same, when should I use one or the other, and so on. The fact of the matter is that you can use one or the other and often it comes down to preference as they both yield quite similar results. 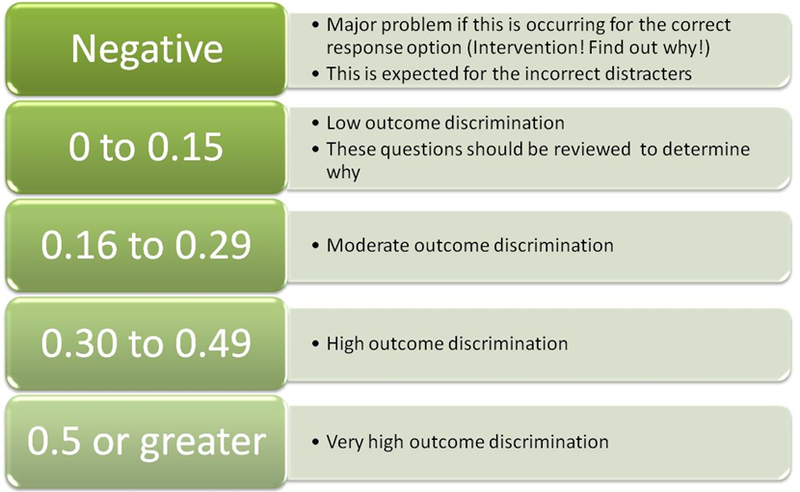 Outcome discrimination is the proportion of the top (27% according to assessment score) of participants who selected a response option minus the lowest (27% according to assessment score) of participants who selected each response option to the question. 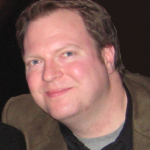 What you would expect is that participants with the highest assessment scores should select the correct response option more often than participants with the lowest assessment scores. Similarly, participants with the highest assessment scores should select the incorrect distracters less often compared to the participants with the lowest assessment scores. 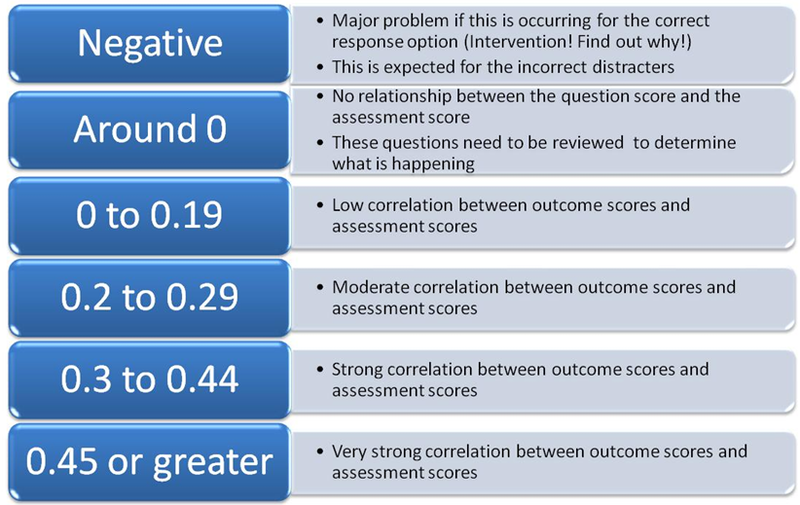 Outcome correlation is a point-biserial correlation that correlates the outcomes scores that participants achieve to the assessment scores that they achieve. So rather than comparing only the top and bottom 27% of participants, the outcome correlation looks at all participants using a standard correlation approach. If you are thinking that outcome discrimination and outcome correlation sound like they might be related to one another, you are right! High outcome discrimination statistics generally will result in high outcome correlations. In other words, outcome discrimination and outcome correlation statistics are highly correlated with one another. How correlated are they? Well, I looked at many real-life questions from Item Analysis Reports that customers have shared with me and found a positive correlation of 0.962, which is really high. In my next post I will provide some criteria that can be used for outcome discrimination and outcome correlation coefficients to judge whether a question is meeting the grade in terms of psychometric quality.